Send us an email. Select your topic carefully to ensure the fastest response. 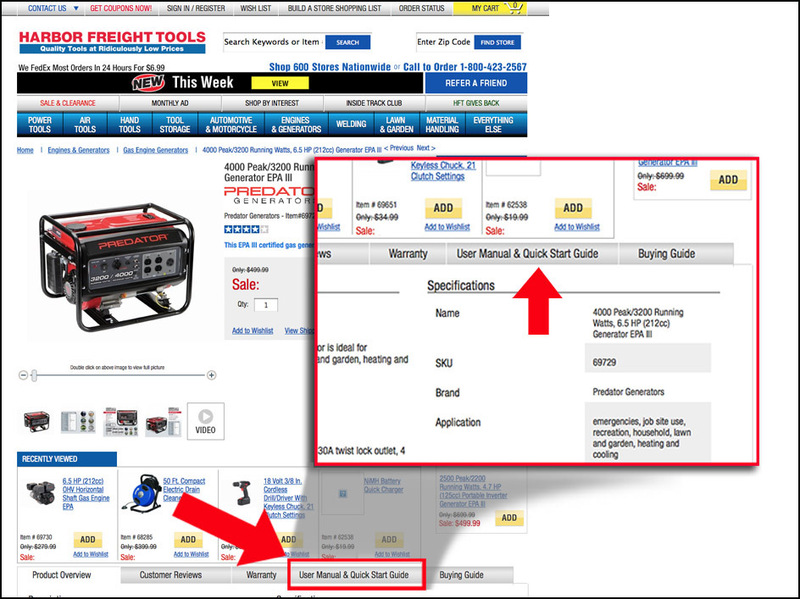 To get your order status, go to HarborFreight.com and click on "Order Status" near the top right corner of our webpage. Under "Track My Order," enter your order number and shipping zip code number, then click the "GO" button. You can also track the status of your order by logging into your Harbor Freight account and clicking on the "Track My Order" link on the left-hand side. If you still need help or would like to leave a comment, please fill out the form below. To review your HarborFreight.com order history, log in to your account from the website and view your order history on your dashboard. If for any reason you are not satisfied with an item purchased from Harbor Freight Tools, you may return the product within 90 days for a full refund or replacement, whichever you prefer. The limited warranty term is 90-day beginning on the date of purchase or order. You must provide a copy of your packing slip/order with the item(s) listed. Shipping and handling charges are nonrefundable. If returning in-store, please provide a proof of purchase. If you do not have a proof of purchase, please obtain a Return Authorization by contacting Customer Service at 1-800-444-3353, Monday thru Sunday, 6am to 6pm (PT). Please provide your name, order number and a brief description of the reason(s) for the return. Online purchases can also be returned to any Harbor Freight store for an exchange or refund within 90 days of your purchase. A 20% re-stocking fee may apply. Just bring the item along with the order packing slip/order and we will gladly exchange or refund the purchase. Due to safety hazards, items that use flammable liquids or gases, or contain hazardous materials cannot be returned through the mail; even if the item was drained of these materials. For safety reasons, certain products cannot be returned to the store if opened. For returns, please call customer service toll-free at 1-800-444-3353, Monday thru Sunday 6am to 6pm (PT). 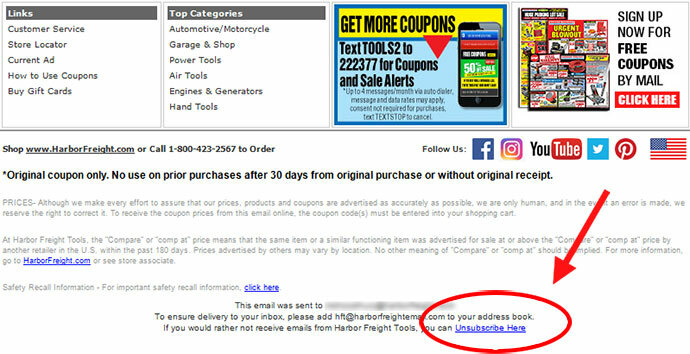 If for any reason you are not satisfied with an item purchased from Harbor Freight Tools, you may return the product within 90 days for a full refund or replacement, whichever you prefer. The limited warranty term is 90-day beginning on the date of invoice. A 20% re-stocking fee may apply. You must provide the original receipt to receive an exchange or refund. Proof of purchase is required for all returns and exchanges. Merchandise may be returned within 90 days of purchase for a refund or exchange in the original tender. Check and debit card purchases may be refunded in cash. A valid government issued ID must be presented at the time of return. For safety reasons, items cannot contain oil or gas in them at the time of return or exchange. For safety reasons, certain products cannot be returned to the store if opened. For returns, please call customer service toll-free at 1-800-444-3353, Monday thru Sunday 6am to 6pm (PT). Select items will be subject to a 20% re-stocking fee. See an associate for details. The manager has the right to refuse returns of any item, at any time, for any reason. For your convenience, you do not have to exchange or return the item to the store from which it was originally purchased. Harbor Freight Tools uses United States Postal Service, FedEx Smart Post, FedEx Ground, FedEx Second Day, FedEx Next Day Air or truck freight line to ship your orders. Harbor Freight makes every effort to process orders within 24hrs of being placed. Orders placed before 2pm (PT) are generally SHIPPED the next business day. You will receive a shipping confirmation email that will confirm which carrier is used for your products. Harbor Freight stores and the website accept Visa, Mastercard, American Express, Discover and Harbor Freight gift cards. Checks and money orders are also accepted for orders placed via United States Postal Service. If an order has one or more items on backorder, Harbor Freight will charge shipping on the entire merchandise total including the shipping cost for the item(s) on backorder. When a backordered item ships, you will only be charged for the item (plus tax if applicable). The item will be sent as soon as our warehouse receives the new shipment. Log in to your account from the website using your user name and password. The "Quick Links" portion on the left-hand side of your account page features an "Account Information" link. Click on it and type your updated email address in the "Email Address" field, then click the "Save" button. Log in to your account from the website using your user name and password. The "Quick Links" portion on the left-hand side of your account page features an "Address Book" link. Click on the link to change your shipping address. You can also click on the "Add New Address" button on the top right corner to update your address book with multiple addresses. After entering the updated address, click the "Save" button. If you would like to add, update or remove your mail or email subscription information, please enter your request in the comments field below. Unsubscribe from emails by clicking the “Unsubscribe” link at the bottom of the email, see the example below. Log in to your account from the website using your user name and password. The "Quick Links" portion on the left-hand side of your account page features an "Account Information" link, click on it. Then click on the "Change Password" box. New fields will appear below: enter your current password, new password and then confirm your new password. Click "Save" to register your new password. Go to HarborFreight.com and in the top center of the page, click on "My List". Enter your email address and password to login. Your list will be immediately viewable. Log in to your account from the website using your user name and password. The "Quick Links" portion on the left-hand side of your account page features a "My List" link. Click on it to view your list. WHAT IS THE ITC PROGRAM? Harbor Freight Tools’ Inside Track Club is an annual paid membership program that provides additional savings and exclusive promotions for its members. ITC members can literally save thousands of dollars per year compared to preferred customers. Click here for more information about ITC or to register. Visit the ITC coupons page here for a current list of special ITC discounts and promotions! Sign in here to update your ITC information. To request a free catalog and sign up for emails or text messages, click here. If a user manual is available for an item, it will be available through the product page, located on the “User Manual” tab. Manuals are viewable as PDF files. You must have PDF software (e.g. Adobe Reader) to open and read the file. If you do not have PDF software, click here for a free download. You may read the manual online or print it out. For technical product assistance, submit your questions using the convenient online form, or call 1-888-866-5797, Monday thru Friday, 7am to 4pm (PT). Many of our products have replacement parts available for purchase. To purchase a part, please contact Customer Service at 1-800-444-3353, Monday thru Sunday 6am to 6pm (PT), or via email. Specify the product name, item number and description of the part when making your inquiry. Harbor Freight values your safety and satisfaction. We make sure to provide you with up-to-date information on any recalls or product safety news as it comes available. We will post product recalls from the U.S. Consumer Product Safety Commission (CPSC). For more information, you may also visit the CPSC Web site at www.cpsc.gov. As it relates to Harbor Freight, the information provided here is based on press releases that involve product sold through Harbor Freight stores or on HarborFreight.com. The information includes the products involved and the steps to take if you have one of the recalled items. Consumers should stop using recalled products immediately unless otherwise instructed. Also, the Web site www.recalls.gov links visitors to the home pages of government regulatory agencies responsible for product recalls. In addition to finding details about recalled products, visitors will gain additional safety information and may sign up for email alerts on recalled products, as they become available. Certain Harbor Freight products feature software that may be updated as needed. To get the latest software upgrade for your product, visit the respective product page on the Harbor Freight website and click the "Software Update" tab. Then click on the download link which will be in a zipped format with the updated file. Instructions will appear on how to install the software update. Our Extended Service Protection plans provide 1 or 2 years of coverage for eligible products that begin when the limited manufacturer’s warranty ends. ESP plans can be purchased at Harbor Freight Tools stores within 30 days of the eligible product’s purchase date or by calling our Sales Department at 1-800-423-2567, Monday thru Sunday 6am to 6pm (PT). Customer Service is available for existing plans at 1-888-838-3421. *Exclusions apply, see full terms and conditions. **If product cannot be repaired within 15 days, a new product of equal or similar features, capacity, specifications and/or efficiency and functionality will be provided. Product will also be replaced if the same major failure occurs and requires 3 service calls within 12 months. If a replacement product is not available, we will either issue a Harbor Freight Tools’ gift card or provide a refund up to the actual cash value of the product, not to exceed the original purchase price of the covered item. Repair with use of non-original manufacturer or remanufactured parts is allowed. Replacement of product, issuance of a gift card or a refund deems plan fully performed (N/A in AZ and NV). The obligor and administrator is Federal Warranty Service Corporation, P.O. Box 105689, Atlanta, GA 30348-5689, 1-877-881-8578 in all states except United Service Protection Inc. in FL and Assurant Service Protection, Inc. in OK.
For information about gift cards, click here. For information about donations, click here. For information about store locations, click here. For information about employment opportunities, click here. * Where did you make your purchase? *Would you like to be contacted about your comments? * Best time to call?